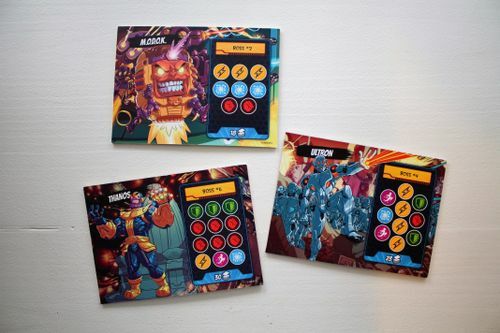 How to Play: Each player selects a Marvel hero with a unique special ability and a unique deck of ten hero cards. 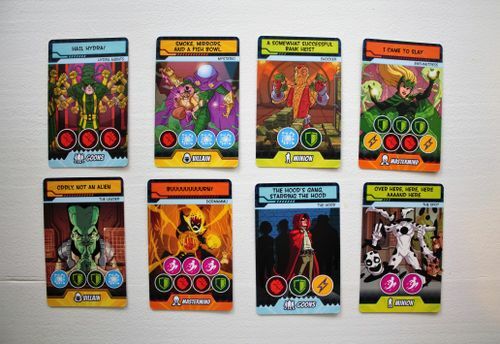 Then the players select a boss to cooperatively face and set up the deck of enemies with the appropriate amount of door cards (enemies to face) and crisis cards (one-time negative cards). 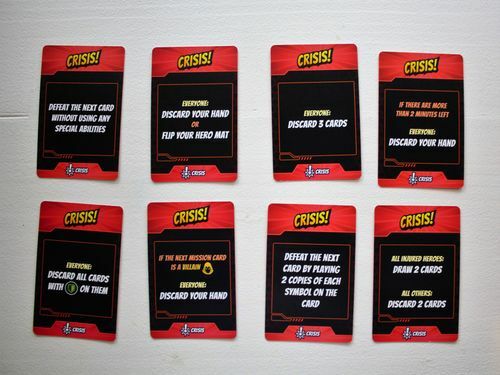 After starting a five-minute timer, the players try to progress in real-time through all the door and crisis cards by playing resource cards (regular cards all heroes use) and/or hero cards (the unique deck for each player that contains powerful resource cards and also powerful player powers). Each hero also has a special ability that can be employed by discarding any three cards from their hand. If the players defeat all the enemies and crises, they’ll face off against the boss by playing the cards depicted on the boss’ board. The team must defeat all cards and the boss in less than five minutes to win! 1. There’s plenty of Marvel flavor. The hero choices in this box are…perplexing. I’m not sure why Squirrel Girl and Spider-Gwen beat out Thor (who was apparently pictured on the original box) and other favorites, but the art and excellent graphics ooze Marvel flavor. I am very impressed by the look and feel of the game. 2. It makes sense as a real-time game. The mechanics of this game (frantically playing cards and abilities against overwhelming hordes of enemies and crises) lend themselves to the real-time feel. And the five-minute game time is perfect; anything more would probably be too stressful. I generally don’t like real-time games, but I make an exception for 5-Minute Marvel. The short playtime means you don’t feel stressed out afterward (as I always do with the Escape games), so my group usually plays three times in a row before putting it away. 3. While it’s a simple game, you can develop your “skills.” There are basically three types of heroes: those who draw cards (four heroes), those who defeat a particular type of enemy (four heroes), then Hulk/Captain America (you can combo them to defeat any door card). Each type of hero plays differently. And even though the heroes only fall into three basic categories for their abilities, each hero’s hero cards more varied. Some of the heroes with worse abilities have more powerful hero cards and vice versa. On top of the variability in the hero cards and abilities, you also figure out how to most efficiently defeat enemies over time. New players will be a substantial step behind those who have played the game multiple times. 1. The characters were more balanced and had more interesting powers. Many of the heroes have similar powers to one another. 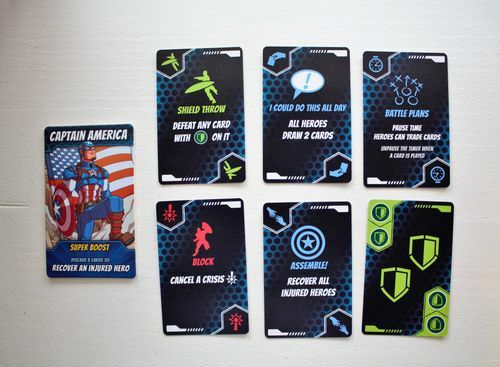 Four of the ten heroes have draw-based abilities, four have powers to defeat certain types of enemies, and only Hulk (defeat any card but become injured) and Captain America (heal an injured player) have unique abilities. Not only are the heroes redundant, but some are just simply much better than others, even if their hero cards are different. I never use any of the heroes who help draw cards except Ms. Marvel anymore because the others are vastly underpowered by comparison. The same is true of four other heroes who can discard three cards to defeat a Goon, Minion, Villain, or Mastermind respectively. Only the Mastermind cards require more than three cards on average, so it’s rarely helpful to spend three cards to defeat a Minion, for example, who should only take 1-2 cards. Simply put, I think we need an expansion with more unique powers. 2. The bosses played differently. There are six bosses included in the game, which is a great number, but they’re all essentially the same except for the number of cards you have to face in order to defeat them. I’d love to see some special powers or maybe some unique villains for each boss. 3. There were less luck. Two co-workers and I have played this about fifteen times. We’re really good as a team now, and we’ve figured out how to maximize our characters’ abilities and cards. We recently played Thanos (the hardest boss) on hard mode with even more of both types of cards added to the deck. We only lost the first two tries because of poorly-timed cards. For example, we drew a card that side “Discard your hand if there are more than two minutes left on the clock,” and we had 2:03 on the clock. We’d just drawn a ton of cards, so we had to discard about 30 cards among the three of us. We had no chance after that. The third time we tried, the crisis cards were manageable, and we easily won. I’m okay with the amount of luck, but I think some people would be turned off by it. Overall: Legendary: A Marvel Deck Building Game is my favorite board game of all time, so I was excited to try another Marvel game, even if it’s vastly different. I’m glad to say 5-Minute Marvel packs just as much Marvel punch, maybe even more, because it’s compressed onto such a short time frame. Don’t misunderstand me; it’s nowhere near as good as Legendary, but it sure is fun. Marvel fans will love the art and graphic design of this one, as well as the adept mapping of the superhero theme onto a real-time game. This is a simple game that can be taught in 2-3 minutes, but it’s also one that rewards numerous plays. On the down side, the characters really lack diversity in their skill sets. Additionally, some of the choices for inclusion in this game were dubious at best. I’m still not sure how Squirrel Girl made it over Thor (who was apparently going to be in the game at one time). Additionally, the six bosses in the game play identically except for the number of cards you have to defeat in order to face them. Both of these complaints could easily be addressed through an expansion. Overall, I’d recommend this game as one with wide-ranging appeal and a quick playtime. 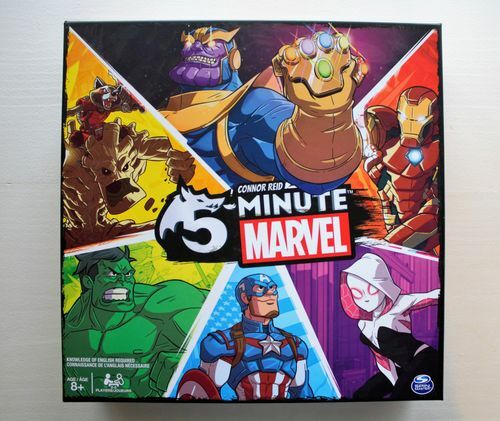 It’s probably not for those who dislike real-time games (although I dislike real-time games and enjoy this one), and there’s a decent degree of luck, but 5-Minute Marvel is a wild and fun filler if you can find it for a good price. A quick comment on your #1 of "I'd play it more if:". A hero is not only his special ability. It also includes his special cards. The heroes who do not have a special ability that is all that engaging has more interesting and usually more powerful special cards. Like you, I was not interested in playing some of the heroes because of uninteresting super powers. However, after a while, I tried them out anyway and found they had cool special cards that more than compensated. I say, try the "uninteresting" heroes more than once and see for yourself. It's true. In that same paragraph I mentioned, "Not only are the heroes redundant, but some are just simply much better than others, even if their hero cards are different." I agree with you, but I haven't found the hero cards powerful enough to negate the weaker abilities. Definitely let me know if there are characters I should give another shot.